Sign up today ... only N100! STOP procrastination STOP that postponment, get protection NOW! Tomorrow may be too late. Even though you have live security guard at the gate, your home still need I-NET HomeGuards to take the picture of the intruder, call the police, send SOS-SMS messages to your other family members and friends, if your security guard is in trouble. 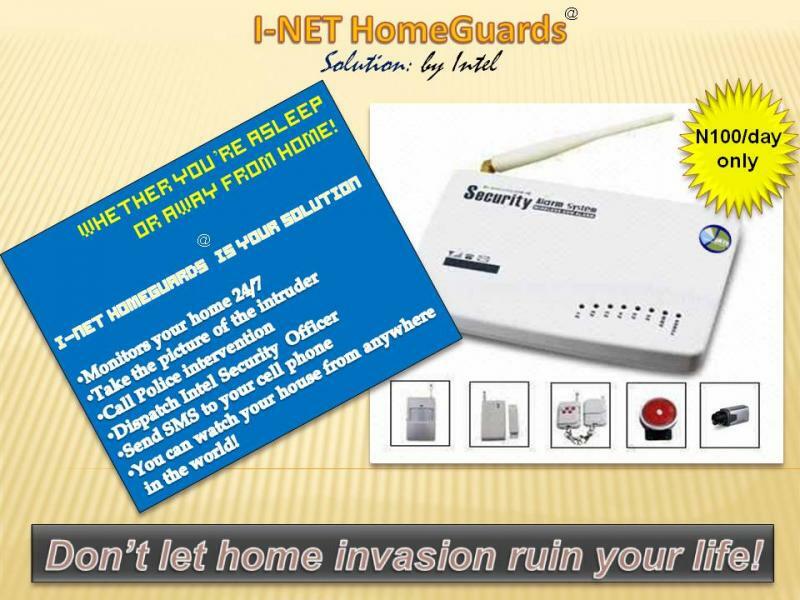 I-NET Home Guards is the only solution you need to secure your home, alerts your neighbor by siren sound whenever there is home invasion and on top of that, Intel Security Network will dispatch security personnel to your home if you face life threaten situation, so you are not alone. With I-NET HomeGurads, you can watch real time and live video of the unwanted guest at your home right from your workplace or from any part of the world, just a click to your cell phone of PC. Start today for just N100/day and get the protection your deserves.